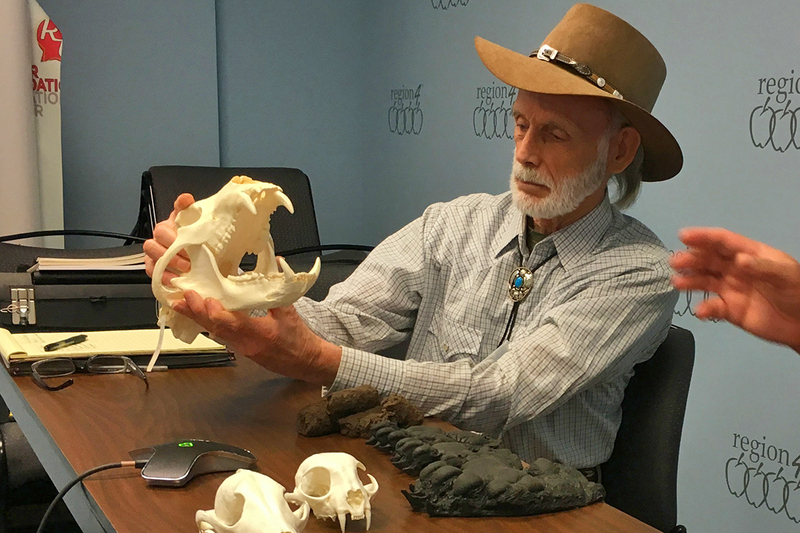 The Virtually Wild Texas program started out as a way to bring nature to kids in hospitals. But now, educators across the state are using it to supplement real outdoor adventures. 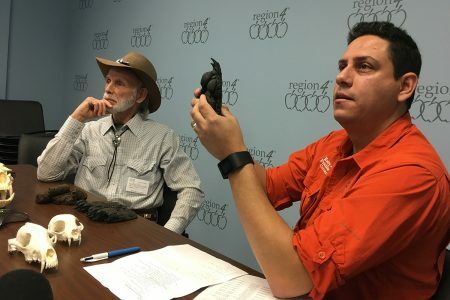 Jaime González of the Katy Prairie Conservancy (right) holds a mold of a black bear paw while answering a question from one of the Texas schools watching via video conference as Dr. Adrian Van Dellen of the Texas Black Bear Alliance looks on. Kids these days (and adults for that matter) spend a lot of time in front of screens. 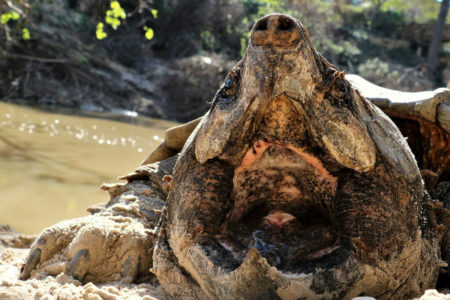 But a program originating from Houston aims to get them out into nature using some ironic methods — video screens. The Virtually Wild Texas program allows numerous classrooms at a time from around the state to a watch a field trip in progress. Typically, a wildlife expert gives a demonstration out in nature or sometimes from a studio. Kids can ask questions of the presenter in real time. The program’s no substitute for getting out into nature for real, says Jaime González. He’s with the Katy Prairie Conservancy and leads the presentations. But he says it can help whet kids’ appetites for exploring the outside world by introducing them to ideas they haven’t thought of before. 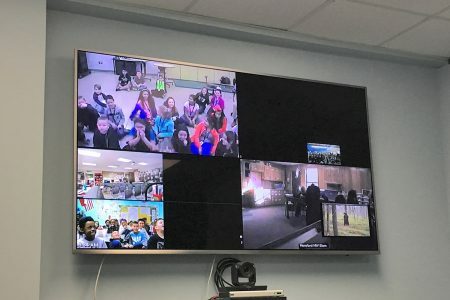 Classrooms from around Texas log on to watch a “virtual field trip” via video conference as a part of the Virtually Wild Texas program. 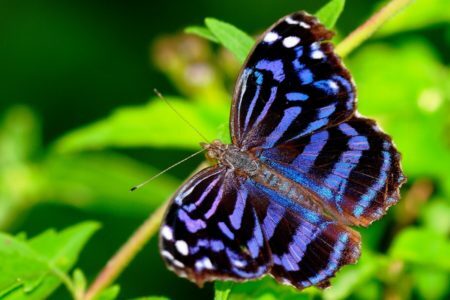 The program started off as a way to bring nature to students who were stuck in hospitals. But schools got on board because the presentations can be much more cost effective for some — compared to loading up school buses and disrupting a whole day of instruction. 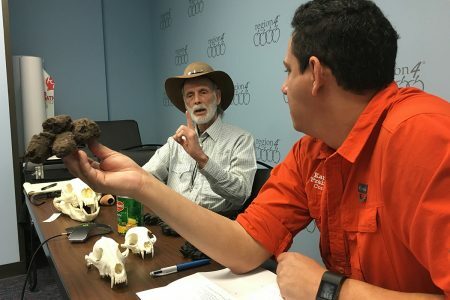 Dr. Adrian Van Dellen of the Texas Black Bear Alliance holds open a black bear skull during a presentation on the animals for the Virtually Wild Texas program. In the audio above, Houston Matters producer Michael Hagerty went to watch a presentation for himself. 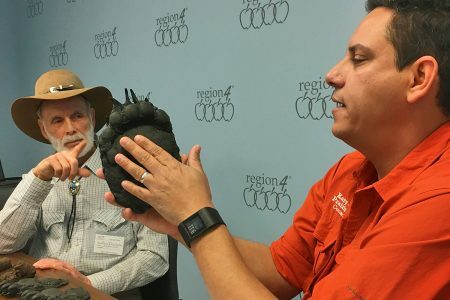 This one was about black bears and featured Dr. Adrian Van Dellen of the Texas Black Bear Alliance. The session was broadcast from a mini-studio at the Region 4 Education Service Center in northwest Houston. Virtually Wild Texas is a collaboration between Region 4, the Katy Prairie Conservancy, and U.S. 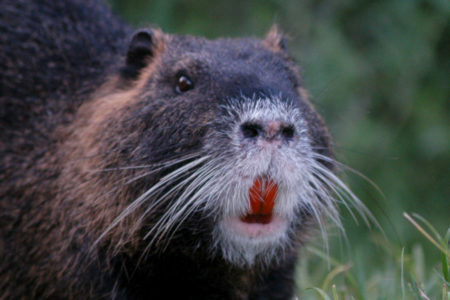 Fish & Wildlife Service’s Houston Urban Wildlife Refuge Partnership.